This picture, taken while I was researching Easter Island for a Fodor’s guidebook has the distinction of heavily misrepresenting how much of a daredevil I am. 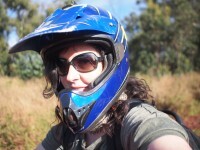 Not shown, hands on ATV handlebars, holding on for dear life. I am Eileen Smith. ExBrooklynite, current Santiaguina (Santiago, Chile dweller). Here are some things you might want to know. This blog is one place I write. I also write for magazines, guidebooks, apps, websites, etc. My main interests are Latin America, food, culture, language, belonging and place. Here’s a link to published work current and forthcoming. I translate Spanish to English. My areas of expertise are tourism/travel/culture and education/communication. I do not translate English to Spanish. I also edit scientific papers written by native Spanish speakers in English for publication in major journals. As a result of that I know a lot about parasites in Chile. Job benefit? Contact me for rates: bearshapedsphere at hotmail.com. I still don’t have photo galleries connected to the blog. Some of my published pieces feature my photos, some use those of dedicated photographers who came with me, or before or after me. I love photography very much, but wearing all the hats while trying to interview someone and formulate a story is not actually ideal. I do some video and audio posts. Here’s some stuff on Vimeo that I filmed and edited. Here’s some audio posts on Soundcloud. I am from Brooklyn, NY. My living trajectory has looked like this: Brooklyn–>Amherst, MA–>San Francisco, CA–>Amherst MA–>Central America–>Portland OR–>Washington, DC–>Portland, OR–>Cuenca, Ecuador–>Washington, DC–>Santiago, Chile. I left home when I was 17, and have been living in Chile for twelve years, but that doesn’t stop people from asking me for advice about New York all the time. Almost every place I’ve ever lived has had a 5 in the address. I have a JD (Law Degree). It seemed like a good idea at the time, which was a long time ago. It has been handy in complaining about unjust contracts with noncompete clauses and one time in arguing with a landlord who was trying to make me pay an extra month’s rent. Aside from that, and a few long-standing friendships, it has not been terribly useful. I am lucky enough to do things I mostly love for a living, despite having studied law. I studied theoretical linguistics in college, and Masters’ level work in English language teaching pedagogy, taught English for about five years, in Chile and the United States. I don’t teach English anymore, but I still love language, and write about it often, particularly my relationship with Spanish. My favorite thing I’ve written about language learning to date is a piece on learning to be a good listener when the productive language skills had not yet come along, and it was republished in an Oxford University Press textbook in 2012. Mainly an 14-year old white Bianchi Boardwalk Hybrid. I ride around the city and go on longer jaunts, and will often ask if I can bring my bike into your house when I arrive, as bike theft is common in Santiago. I’ve done self-guided, multi-day tours in the United States, Chile, Costa Rica and New Zealand. twitter- @bearshapedspher In English and Spanish about Chile and not. instagram-I share this account on food and drink in Chile with a friend. Fish is me, meat is her, and the other stuff, you’ll just have to guess. I gave my blog a silly name, but there is a reason. Want to know what it means? Click here: Why a Bearshapedsphere?